The General Secretary of the Communist Party was always in the center, of course, but he was not the interesting person. Everyone knew that he was going to be in the first place. The more interesting people were the ones who surrounded him, the ones to his right and to his left, the ones closer to him and the ones farther away. From the position of the people in the photographs, our intelligence services could tell which apparatchiks were most in favor in the Communist party, and who was falling out of favor. They could tell who was on his way up and who was on his way down; who was influential and who was not. Of course, the ultimate sign that a Party man had fallen out of favor was when the photo in which they appeared was re-touched so that they no longer appeared in the official photograph. Not only had they been jailed, or even murdered, but they had literally been erased from the historical record. If only the Soviets had known about Photoshop. In government, at school, at work, there are always people jockeying for position; they are trying to get a higher place and avoid being put down to the lowest place. Often they tear people down in order to build themselves up. Some of them are ruthless. Well, people can see through that, too. But the point is that we all do this; we all want to put ourselves up, and to do this, it seems often we have to put people down. We do this because we want to be secure, we want to have influence. Jesus puts the lie to our pretensions. He sees the religious leaders maneuvering for position, trying to take the seats closest, perhaps to the one who is throwing the dinner for Jesus; perhaps closest to Jesus himself. And so he tells a parable which brings this behavior to light. It is not likely that he ever said anything negative about the people themselves, but the point he makes is clear. As far as the first parable goes, it is much the same as the reading we heard from the book of Proverbs. We want to avoid being shamed and we want to be honored. To put oneself forward as someone important is dangerous and can lead to being put to shame. As far as the first parable goes, it might be interpreted as simply a more subtle way of seeking honor from other people. Perhaps it is a ‘humblebrag’ for someone to just hang around the circle, to seek a low place, hoping that someone will notice. But then Jesus tells another parable, one that cannot be mistaken for a way to get recognition by human standards. By this parable, we recognize that we are not in the realm of human wisdom at all, but God’s wisdom, which turns all human wisdom on its head. 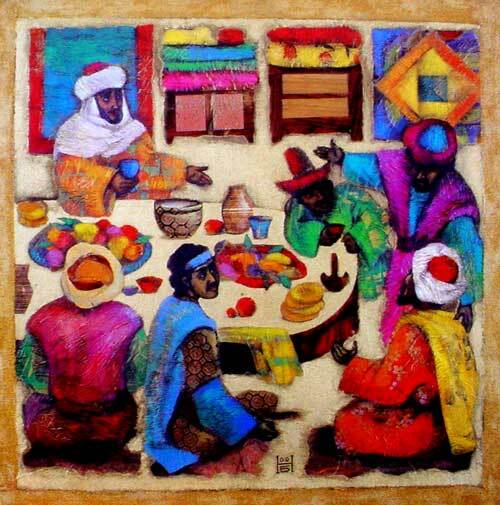 Jesus talks about throwing a party not for the important people, as the Pharisee is throwing a party for Jesus (perhaps hoping for a commendation or an endorsement!) but for the forgotten, the handicapped, and the poor. One will gain nothing by doing this. The forgotten cannot improve your position in society. They cannot repay with favors later on. They cannot give you a recommendation for a job or float a loan. But in doing things this way, one is not looking for human approval, but God’s approval. Maybe a better way to say this is that in doing such things, one is not seeking self, but seeking God. Perhaps we think that the more religious one is, the less likely one is to do this sort of thing. Perhaps this story ought to make us think again. Jesus told these parables to religious people. The truly faithful among them recognize themselves in the mirror Jesus is holding up to them, and respond not with anger, but with repentance. This parable isn’t necessarily about parties, either. We will still invite our families and our friends to birthday parties for our children and grandchildren. It is, however, about how we act at work, who we invite to church, who comes to the backyard barbecue, and where a lot of our money goes; whether all of it goes to extravagances for ourselves and those we deem worthy, or whether much is given for the work of God to spread the Word and to come to the aid of those who are in need. But most of all, in this parable we are led to the heart of God. For we are not only the ones who throw the parties. In fact, perhaps we aren’t the ones who throw the parties at all. Perhaps we are the poor, the blind, the lame, and of course in some ways we are so literally as well as figuratively. We have nothing to commend ourselves, no right to put ourselves forward in the presence of God, to receive honor from him as from a fellow human being. To be in the presence of God is to know our own humanity and to know that humanity as a truly humble thing. No ‘humblebragging’ here, no seeking of self, because when one knows oneself to be in the presence of God, selfhood shrinks to insignificance. Instead, God comes to us and celebrates his love with us, pouring out his own self in Jesus Christ, saying to us, ‘Friend, come up higher.’ To know this is to know that the honor given us is simply to be clothed with God’s honor, it is to have the selfhood granted back to oneself, not for self alone, but for God. Here at this celebration, we kneel side by side, not one of us in a higher position than the other. Even those in the center, the pastor and the assistants, are not clothed with self, but clothed with the garments of baptism, and stand in the place of servanthood. At this table, God himself in Christ is the host and the meal. We cannot repay him in any way; we are sent forth to imitate his serving love among all people, empowered by the Holy Spirit. What we experience at this table is the vision for our lives and for all lives.